Air Asia Promo Fare 2018: Have you been thinking of planning your next plane adventure or visiting another tourist attraction for next year, 2018 as early as now? 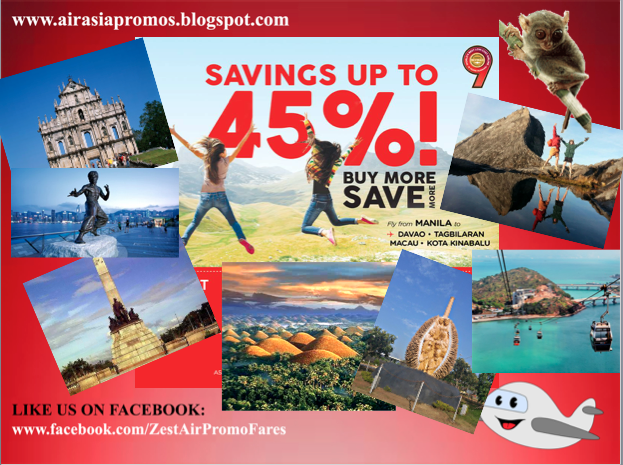 We do believe that AirAsia Philippines has a great offering of cheaper fare to its passengers. They are currently having a promo that could save you more up to 45% Off when you book your tickets. How? What will be the destinations? Book your tickets and avail this discount promo here. - Discount is not available during peak period. - Discounts are subject to availability and on selected flights only. - Available on web and the AirAsia Mobile App. Take note that the discount is only from the BASE FARE. Applicable fees aply. What's the promo all about? The 'Buy More, Save More!' promotion means that the larger your travel group is, the higher discount* you'll get! This promo allows guests to enjoy 15% off base fares when they book flights for one guest, 25% off for two guests, 35% off for three guests and 45% off for four guests or more in a single booking.